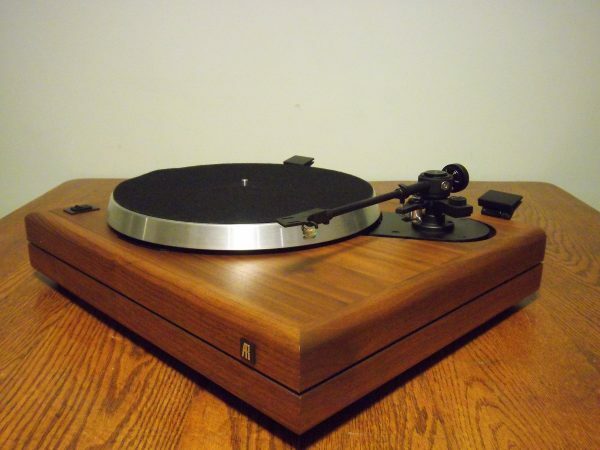 Home / Vintage Turntables For Sale / For Sale: Gorgeous Stock AR the Turntable w/ Box! For Sale: Gorgeous Stock AR the Turntable w/ Box! Is the spindle straight? Was the drive platter cleaned of old belt residue, which can cause rumble? If an AR table fails to pass any of the above inspections, Vinyl Nirvana corrects the problem before it gets listed. If the turntable is unsellable due to too many defects, it becomes a parts unit to be used in the restoration of other AR units. In addition to this multi-step inspection, each turntable is thoroughly detailed with appropriate cleaners. The average cleaning takes up to two hours. Though the tables Vinyl Nirvana sells will vary cosmetically, they will always be clean. Can you trust Vinyl Nirvana as a seller? See our testimonial page . What our customers have said about our sales and service is a true source of pride for us. Been doing this for many years, but this has to be one of the nicest stock AR the Turntables to ever cross my bench. Cosmetically, this table is an 8.5 on a scale of 1-10. (I’m a hard rater.) The walnut veneer is in excellent shape, with only the slightest abrasion near the back of the curved tonearm cut-out in the plinth. (see pic) The metal portion of the plinth is in excellent condition (See photo without platters). There is a dustcover, also in excellent condition. If you care to, we can modify the table in any way you wish. I’d love to have a discussion with you about the upgrade path. The stock AR tonearm is in outstanding cosmetic condition, and functions perfectly. If you purchase this table, we can discuss other cartridge options as part of the sale. I have several recommendations. If I mount and align your cartridge, it makes set-up in your home incredibly easy, plus you get the piece of mind it’s been done right. In the photos, there is a lightly usedDenon DL – 160 mounted and aligned. The cartridge is not included but can be added. Note small abrasion at bottom of the curved edge. Price does not include shipping. This table will be packed like it is a fragile pane of glass. I simply care too much for these tables to just shove them in a box. I will carefully pack the table in extra sturdy boxes. and bubble wrap. I prefer Fedex Ground. Lastly, I am truly not in this just for the money. What I love best is introducing someone new to the joys of vinyl, getting someone back into vinyl who left it for the “superiority” of cds, or helping someone else who does appreciate it to “move up.” In that regard, I do what few sellers do…if the buyer needs it, I can supply up to one hour of help by phone with set up. (At a mutually arranged time.) In general, most buyers don’t need it, but if there IS a problem, I am there. Some comments from buyers below and here.